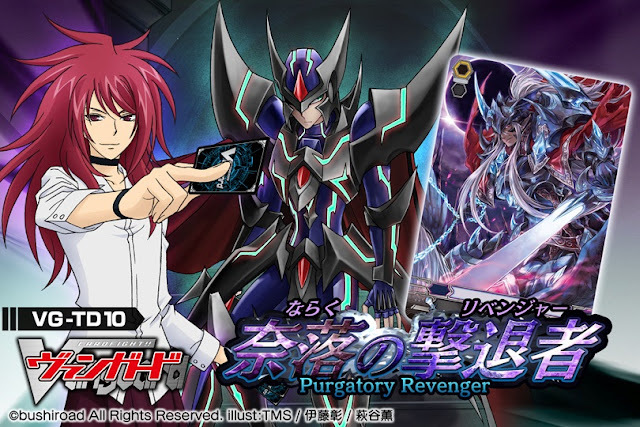 The bomb dropped this morning with the reveal of the upcoming Shadow Paladin trial deck, VG-TD10: Purgatory Revenger (奈落の撃退者 lit. Revenger of Hell, Revenger of the Abyss, Revenger of Hades et cetera.) This trial deck, which was first announced in Bushiroad's December 5th press conference and confirmed for a June 2013 release last February, will renew the Shadow Paladin strategy with a new subgroup of "Revenger" units as counterparts to the Gold Paladin "Liberator" subgroup. Promising the introduction of a Shadow Paladin break ride for further support, many hopefuls are eager to see the Shadow Paladins return to prominent competition after their celebrated victory in the amateur VGCS tournament. The anime's most prominent Shadow Paladin cardfighter, Suzugamori Ren is being used as the cover character, suggesting that he'll be getting more extended screentime for Link Joker, in contrast to his gradually-reduced role during the Asia Circuit. Blaster Dark is also featured prominently, and is speculated to undergo a reimagining similar to the Blaster Blade to Blaster Blade Liberator conversion, as "Blaster Dark Revenger." Continuing the theme of previous Shadow Paladin boss cards Phantom Blaster Dragon and Blaster Overlord, the as of yet unnamed grade 3 for TD10 features a prominent eclipse. Artist Hagiya Kaoru, previously known for illustrating Origin Mage Ildona, Skull Witch Nemain and both Gancelots, is among the artists credited, and the unnamed card is very recognizably in his style. With veteran artists like Hagiya and Itou Akira at the new deck's helm, it's clear that a lot of attention is being put into this new deck. Additionally, news of a new clan has sprung up along with the announcement of TD11: Star-Vader Invasion (侵略の星輝兵 Invasion of Starlightsoldiers) which will introduce the new clan, Link Joker. Like TD08, 09 and 10 before it, TD11 will introduce a break ride unit. 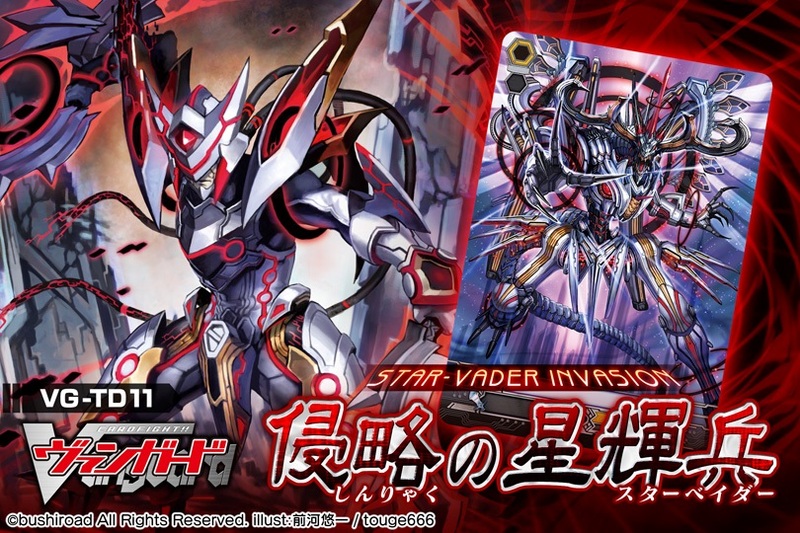 Bearing the third season's title, the clan is being speculated by fans as the antagonist clan for the season, much as Shadow Paladin and Aqua Force served in the past; the otherwordly appearance of the two units shown thus far and the trial deck's title may imply an extraterrestrial theme, connected to Cardfight's overall focus on the planet Cray. In addition to its break ride, the trial deck will introduce a "new system" that will overturn "common sense." (This is the same "common sense/常識 joushiki" that the third season has been talking about in its early episodes.) Already it has been noted that the Link Joker clan's nation box seemingly belongs to the United Sanctuary, although US colors have been used as a placeholder in the past. TD10: Purgatory Revenger and TD11: Star-Vader Invasion will be released in Japan on June 22, 2013. Following Bushiroad's current trial deck policies, Revenger's sealed fifty card deck will contain seventeen exclusive cards and three foil cards.